Farkle Dice – Free and Farkle Dice Deluxe (Ad-Free) are two popular and well-reviewed apps in the Amazon Appstore for Android. 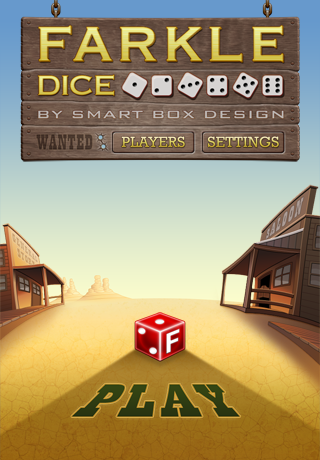 Developed by Smart Box Games, the apps present a fast-paced dice game and offer both solo and social gaming experiences. Smart Box Games was one of the first developers to join the developer program after the Amazon Appstore launched in March. Within a few weeks of its publishing, Farkle Dice – Free skyrocketed to the top of the Board Games category and soon climbed the charts under the Top 100 Free Bestselling Games. Amazon featured Farkle Dice Deluxe (Ad-Free) on July 23 as the Free App of the Day, a daily promotion in which we make a premium app available to our customers for free and prominently promote the app on Amazon.com and in the Amazon Appstore. Our game Farkle has had tremendous success in 2011. I put out this press release today. Bellingham, WA – May 25, 2011 — Smart Box Design today announced the chart-topping highly entertaining game Farkle Dice for iOS and Android has been downloaded more than 500,000 making it one of the most successful dice games available. Farkle offers players an opportunity to challenge friends or compete against a variety of “intelligent” computer opponents with a wide range of personalities—from cautious to daring—that will determine the level of risk each opponent is willing to take when deciding just how far to push their luck. Farkle is an enormously popular game throughout the world. Players roll a set of six dice for points and can continue rolling the dice as long as their roll continues to yield points. Any non-scoring roll is called a Farkle and the player forfeits their turn and any points accumulated during that turn. Like most games of chance and skill, Farkle’s attraction stems from players hoping to beat the odds and roll a high scoring combination. Smart Box Design is known for the attention it places on both the playability and design of its games, and Farkle is no exception. There are very few dice games available for Apple iOS and Android with the quality and attention to detail that went into creating Farkle Dice. The game, which can be customized to accommodate regional rules, is extremely easy for users to pick up and begin playing upon installation. It is beautifully designed with the rich hues of a felt and wooden game-playing surface surrounded by a western theme. Many games feature computerized opponents that are programmed with varying degrees of difficulty (smart, smarter, and smartest). Farkle, rather, comes with a collection of computerized opponents that are programmed to employ different strategies and take various degrees of risk when deciding whether to continue rolling for points—just like different people that Farkle players will encounter as they play the real dice game. Farkle Dice is available either as a free ad supported app or without ads for 99 cents. Farkle Dice has been translated into French, German, Spanish, Japanese and Korean. Smart Box Design, based in Bellingham, Washington, was formed in 2003 by game industry veterans who share a common vision of creating exciting, high-quality, strategy and thinking games for mobile users. Smart Box Design licenses, develops, and publishes games for iOS and Android devices. The company has previously released Farkle Dice, Triples, and WordPop!, a best selling strategy, puzzle, word creation game and continued the series with Word Monaco Solitaire and Word Watch. Many of you have asked for a printable version of the Farkle rules. They are now available in Word format. The file also includes an interesting history of dice and Farkle. Not only is the document helpful in teaching others to play but is a great resource for children if writing a report on dice games. Thank you for making Farkle Dice one of our best selling game. Farkle Dice Upgrade for Windows Mobile – Same Game, but New Experience! 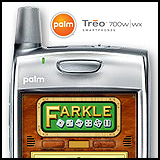 Many of you own the very cool Windows Mobile Treo 700w, 700wx, or 750 and have asked us to make Farkle Dice available for it. We have! Plus we’ve added several great new features for all Windows Mobile devices running 2003 or greater. http://smartboxgames.com/wp-content/uploads/2017/01/sbg_logo_whitetext_trans-1030x259.png 0 0 Todd Sherman http://smartboxgames.com/wp-content/uploads/2017/01/sbg_logo_whitetext_trans-1030x259.png Todd Sherman2007-04-17 17:51:002007-04-17 17:51:00Farkle Dice Upgrade for Windows Mobile – Same Game, but New Experience! Bubble Girl, Farkle Dice, Smart Box Games, Windows Mobile Games, WordPop! Word Pop is a delightful twist on the popular game, Boggle. Your goal is to make words of 2 or more letters from adjacent letters still, but as you make them, the tiles disappear. The goal of each level is to remove all the letters, leaving a clear board for the next round. If you get stuck with letters unable to be made into words, it’s game over. Valid words cannot be abbreviations, hyphened words, acronyms, contractions or pronouns. Acceptable words will change to bold text in the entry bar. At the same time, green tick will become highlighted and the chime sound as you select tiles will raise in pitch. Click the green tick to enter the word you’ve made and remove the tiles involved. …however, that isn’t all there is to it. They have added another twist of bonus tiles. Large word scores and game difficulty level will determine how many you earn. Each tile is scored similar to Scrabble, each adding up into a score. If the score is high enough (40+ points in easy mode, 50+ in Medium, or 60+ in hard) you will receive a bonus tile, which could be another letter or a wildcard tile. If you have more than three, a letter tile will be changed to a wildcard. If you have tiles left, they will carry over to the next level. What if you’re still stuck? Rotate it! The board will rotate, allowing you more options with your tiles. Press the round arrow button and watch your letters change places. What I love most about this game is the separate scoreboard for highest ever word scores. You still have an Easy, Medium and Hard scoreboard, but you can also keep your best word creations in check too. This has become my new word game obsession! Farkle is a developed style of Yahtzee, based more on luck and choice. 2-6 players (computer or human) roll six dice in the hope of rolling certain number combinations. However, in this game, you are aiming to earn the most points. Farkle earns a new category of its own, as you can choose to keep the score you have and pass, or continue rolling. Once all 6 dice are used, you can choose to try your luck again and roll your six dice again. The trick is to stop before you roll without earning points. Failing to score means your turn is over and any score you have banked up disappears — called getting Farkle. As the entire object of the game is to earn 10,000 points before the other players, you want to play on as much as possible, but you do not want to Farkle either. If you get 3 Farkles in consecutive shots, you lose 1,000 points. Strategy is very much part of this game, also. Consider using just a 5 or 1 in a roll to leave better odds for the next. Once a player has reached over 10,000 (or 5,000 depending on game selections) they have finished the game. Other players now have one chance to score higher. If they do, they win the game. Farkle has been kept simple in graphics and sounds, but to great benefit. The game remains the focus, allowing players to concentrate on the action and strategies. The controls are as thought out. Players can do all that’s required with one tap on the correct dice or button. No fussing with dragging or double tapping.